How to Read a Weather Map Properly and Easily? >> How to Read a Weather Map Properly and Easily? If you know how to read weather maps, you can understand the weather easily and know what you can expect out of it. It is true that you get all the updates related to the weather when you are watching the news or while ​listening to the radio​. But it is equally important to know how you should be reading a weather map. For example, you got to know that the areas with high pressure will have blue and clear skies and the areas of low pressure will usually be stormy. You should understand the concept of precipitation and the various forms that it has. The different forms of precipitation include rain, snow, sleet, and hail. One of the major aspects of interpreting the weather is understanding the diverse actions that are caused by the difference in the air pressure. High pressure means dry weather and low pressure is associated with hot and humid air, and precipitation in certain cases. It is extremely important to study a weather map first if you want to learn how to read it. Herein, you can watch television news or can find a weather map online. In addition, the newspapers come with the weather maps too, and they are extremely reliable and cheap. You can carry the weather maps along with you so that you can learn up all the symbols within a short time. If you can, you should try to find maps that cover smaller areas. They can be interpreted easily. In case you are a beginner, it can be difficult for you, especially if you are focusing on a huge area. On your weather map, you have to notice the location, arrows, lines, colors, numbers, and patterns. All these sign counts and they are different from each other. To understand the areas of air pressure, you have to look for the isobars on the map. 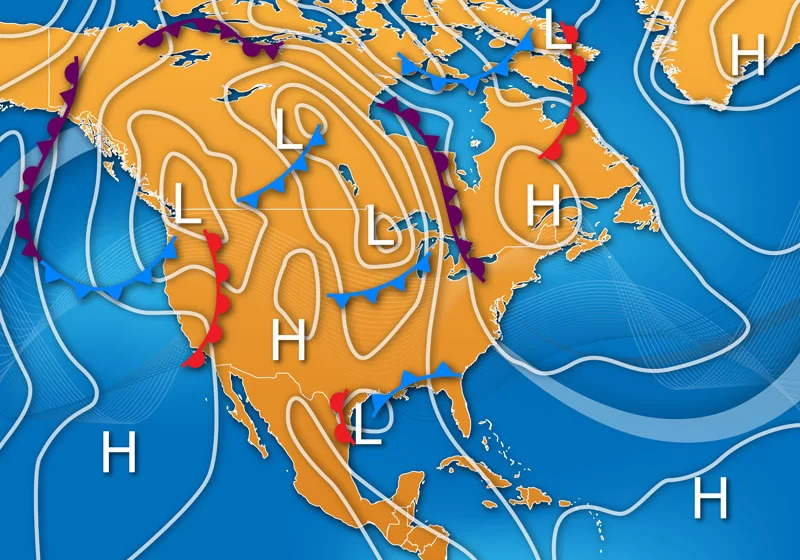 Isobars are curved or plain lines, which indicate the areas of low, equal or high pressure. Isobars are extremely important as they play a crucial role to determine the direction and the speed of the wind. When the isobars form concentric circles – that are not necessarily round – the circle present right in the center is what indicates the pressure center. This is a low-pressure or a high-pressure system. They are normally depicted by L or H.
In addition, when the isobars situate far away from each other, it means that the winds are lighter. If they are closer to each other, the winds get stronger. You have to observe the various types of fronts and their movements. They are known to draw a line between the warm air and cold air. On the weather maps, you can see a few lines that have triangles and semi-circles or both together. These are known to indicate these boundaries for the kinds of fronts. The triangular blue lines on a side are known to represent the cold fronts on a weather map. The direction in which the triangles are pointing is the cold front’s direction. Red lines with semi-circles represent the warm fronts. Purple lines with both the triangles and the semi-circles represent the occluded fronts. The side on which the triangles and the semi-circle are present is the direction of the occluded front. When triangles and semi-circles border a line and are positioned opposite to each other, it is a stationary front. This represents that this front is stable in one place. You have to know the other symbols on your weather map too. Temperature and Rainfall are recorded in Celsius and millimeters respectively. The circle that is present in the center represents the cloud cover. The pressure gradient will be mentioned in millibars. If you know all the symbols of a weather map, you can read it easily. To conclude, this was all for today’s know-how. Follow these above steps if you are interested in learning to read a weather map. These are easy as cheese! How to Stay Cool in Hot Weather While Working Outside? DIY Tornado Shelter: Why and How To Do It Step By Step? Camping in the Rain: How to Set Up a Tent Comfortably?